The Carriage House is in Burlington's charming and historic South End. The Carriage House apartment (A) is a recently renovated apartment with private entrance, Brazilian cherry floors, full bath, queen bed, pull out queen size couch, full gourmet kitchen with all your cooking essentials, and a private outdoor patio --a great place to enjoy your morning cup of coffee or afternoon glass of wine. The living room features a 32” flat-screen TV loaded with a premium cable package that includes HBO, Showtime and countless other networks and channels. We are ideally located on a quaint residential street, walking distance to Church Street Marketplace, Burlington Waterfront, local beaches, the bike path, and so much more. The park at the end of our street has tennis, two playgrounds, soccer, basketball, baseball fields, a community garden, and dog friendly areas for walking and frisbee. The south end's seven sister's neighborhood is unique. Although it is very close to town and the University, it is very quiet. This historic location hosts Citizen Cider, Arts Riot, Dedalus Wine Shop, Tomgirl Juice Company, Great Harvest Bakery, Zero Gravity Brewery, Queen City Brewery, Champlain Chocolates, Lunaroma Aromatic Apothecary, New World Tortilla, a thriving Arts community, all within a few blocks to name only a few of the neighborhood highlights. Most houses are on small lots built in the late 20's and 30's and are designated Historic by the Registry of Burlington. Dori is a Nurse Practitioner and has spent many years of her career teaching and in clinical practice. She is a dog lover and enjoys hosting guests from around the world. The South End is the place to be in Burlington! It is close enough to interface with the thriving art, intellectual, and cultural communities while also being a quaint, quiet, and recently turned - trendy residential neighborhood. I like to think of the Carriage House as a place to de-stress, and unwind, with a comfy no-fuss feeling. The garden has a relaxed bohemian style where one accepts quirks and imperfections. From every open window to the court yard you can listen to the melodic sounds of the water fountain and birds. I want my guests to feel at home and not worry that anything will break or that you will have to do anything with too much speed. Outdoor patio and yard with chairs, table, additional seating, charcoal grill, and patio swing are for all guests to use. I have one sea kayak at a local beach and it can be used if requested after signing a risk waver. There are three Bikes on Site to ride at your own risk ;). There is safe place to store your bikes on the property. On the property behind the main house that is common use. There is a park at the end of Caroline street with Tennis courts, dog friendly areas, local sports, community garden, and playgrounds. Burlington Country Club is one half mile away. Our 3 night stay in the apartment was just what we needed after a week of traveling around NH and Vermont. It was nice to stretch out and have a kitchen so we could cook a meal one evening. Dori was very pleasant and the place was very clean & decorated to feel at home...great location. Quiet neighborhood. Lovely residential area. 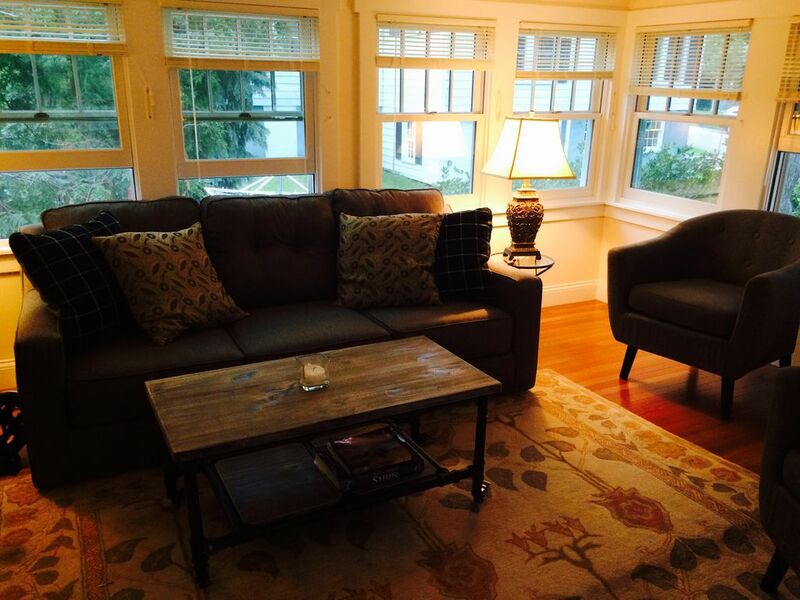 Cozy, beautifully renovated and great location! Our stay was perfect and very enjoyable. Great location close to everything. Dori was a wonderful host!! We highly recommend this rental! This was our first stay at Dories carriage house and hopefully not our last. The place was immaculate, beautifully decorated and in a wonderful neighborhood close to downtown, colleges and the bike trail. It fit all our needs. Lovely property, the best we have rented in Burlington. Dori is very easy to work with. We will return! The apartment is beautifully designed and very well maintained. It has a large screen porch on one end that is very comfortable. The neighborhood is close to downtown and very laid back with a park and bike path nearby. The owner was very attentive to any needs and pleasant to work with. I'd definitely return to the apartment when I go back to Burlington.